San Francisco’s break forces you to fill in for running back Matt Breida and tight end George Kittle. Cleveland’s only regular fantasy starters are Nick Chubb and Jarvis Landry. Still, you must deftly navigate the waiver wire for potential playoff contributors, especially with trade deadlines about to pass in most leagues. JAYLEN SAMUELS, Steelers (Owned in 0.2 percent of leagues): Le’Veon Bell is no longer relevant in Pittsburgh, so now is the time to grab James Conner’s handcuff. When Conner left last week’s game against the Panthers, Samuels scored his first NFL touchdown. This is the time of year to start cutting players from your bench that you will never comfortably start and roster the immediate backups of your best RBs. THEO RIDDICK, Lions (19.5): He has started to re-emerge since the Lions traded Golden Tate, working in the slot and replacing the departed WR as a key target to move the chains. Riddick is purely an add in point-per-reception leagues, but a viable one. The upside is not high, but with 13 catches for 96 yards in his last two games, there is an adequate floor for your flex spot. 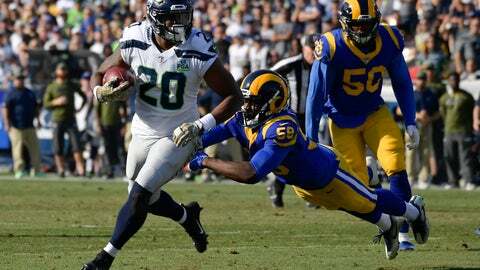 RASHAAD PENNY, Seahawks (13.1): The rookie delivered his best performance to date in Week 10, rushing for 108 yards on a dozen carries and registering his first NFL scoring run. Penny displayed the explosive abilities that made him a first round pick. But you have to be patient with him, as Chris Carson may return to the mix and Mike Davis is the team’s best receiver at RB. Penny may ride your bench in the near future as part of a committee, but Carson is oft-injured and Penny may eventually ascend because he is the most talented RB of the three. ANTHONY MILLER, Bears (13.4): Another potentially explosive rookie, Miller is healthy and starting to make his presence felt in the rapidly improving Chicago offense. He came through with his best performance so far in Week 10, catching five passes for 122 yards and a TD. Miller has scored twice in his last three games and three in his last five. He has yet to display a wider range of his big-play skills, and he may soon approach fantasy WR3 status. DONTE MONCRIEF, Jaguars (15.1); Fantasy owners seem to avoid Jacksonville WRs as a rule, but Moncrief has at least performed respectably enough to make him a quality bye week and injury fill-in. In a dire situation, if you have to start Moncrief, he will provide good enough PPR numbers. He has four double-figure PPR performances in his past six games, and two of those have been 20-point outings. JOSH REYNOLDS, Rams (1.1): Cooper Kupp is done for the year with a knee injury, so you have to take a cautious flier on Reynolds again, who was mediocre in terms of catches and yardage last time Kupp was out but did deliver a two-TD game in Week 8. Reynolds will be fourth, and maybe even fifth in targets for the Rams now, but you have to take a waiver shot on a player with more possible opportunity in a great offense. JONNU SMITH, Titans (0.6): Marcus Mariota has started to raise his game recently, and Smith has been involved enough to make savvy fantasy owners raise an eyebrow. Smith has scored in each of his past two games and has the abilities to start contributing more often on key passing downs. GERALD EVERETT, Rams (1.4): The Los Angeles tight ends could also benefit from the absence of Kupp. Everett scored in Week 10 and along with Tyler Higbee, could start to get more offensive attention from Jared Goff in the weeks ahead. NICK VANNETT, Seahawks (9.5): He has scored in two consecutive games, as he is getting more attention from Russell Wilson in red zone situations. He’s not much more than a TE2 in fantasy but can certainly fill in on a bye week. LAMAR JACKSON, Ravens (6.7): Injury issues and mediocre play appear to be putting Joe Flacco on the hot seat. While Robert Griffin III could get a chance to move in first, Jackson should get his chance if the Ravens get booted out of the playoff race soon, and his dual threat abilities will make him an intriguing fantasy option.